The US needed an excuse to enter WWII, and Pearl Harbor was allowed to happen. The government has been pulling this trick(False Flag) for generations. We didn't enter WWI until the Lusitania was attacked, and that was supposed to be 'The war to end all wars'. Indeed, the government will continue use these tactics to involve us in warfare, because war is big business, and a means of control in lieu of new laws. Ya they were running a drill as the Japanese Zeros were incoming! To those not already invested in a particular version of events, research all sides of the debate and then decide for yourselves with whom you most agree. A full week earlier, on November 29, I learned about the impending attack from an unlikely source â€“ Cordell Hull, Rooseveltâ€™s own secretary of state. To put the matter into proper perspective, I should explain how and why Hull came to entrust me with the terrible secret of Pearl Harbor. On November 1, 1941, Tojo decided to have one more month of negotiations with the American government. If these failed, preparations for wars with America, England, and the Netherlands were to be completed by early December. I feel compelled to mention that, with regard to Pearl Harbor, the only thing I'm convinced of is that the "official story" is bogus. Beyond that, I'm not sure whose alternative version of events -- Stinnett's or Tarpley's -- is most accurate. That's why I posted the links above. Ten days after bombs fell on Pearl Harbor, Lieutenant General Walter Short and Admiral Husband E. Kimmel, the Army and Navy commanders in Hawaii, were relieved of their commands and reduced in rank. Their sin: the Japanese had caught them by surprise and killed soldiers and sailors, sunk ships, and destroyed airplanes. News of Pearl Harbor reached U.S. forces in the Philippine Islands less than half an hour after the attack (about 2:30 A.M., December 8, in the Philippines, corresponding to 8:00 A.M., December 7, in Hawaii). Nine hours later, unopposed Japanese attacks caught U.S. bombers and pursuits sitting on the ground. "If surprise at Pearl Harbor is hard to understand, surprise at Manila is completely incomprehensible," wrote Samuel E. Morison, author of History of US Naval Operations in World War II. Despite destruction of American airpower, no officer in the Philippines was relieved from duty. One officer, the major who commanded the 24th Pursuit Group (PG) at Clark Field, was punished. He never again held a command position. Other, higher-ranking officers â€“ colonels and generals â€“ went on to higher commands. I think the thing you should take from it is that back the 40s the American people demanded some government accountability (even if only was scapegoats) for these kind of events and today there isn't even that token. 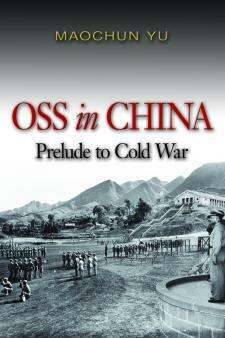 excerpt from "OSS in China"
In late November 1941, Tai Li's well established cryptographic team detected an imminent Japanese attack on the Hawaiian island of Oahu. This ... Intel was stolen ... and promptly dispatched to Yanan and then to Moscow. At this time the Tai Li was working with OSS/ONI navy Milton Miles who also would have relayed the info to the Whitehouse. Lauchlin Currie was Administrative Assistant to President Franklin Delano Roosevelt, and a Soviet spy. Harry Dexter White was an American economist and senior U.S. Department of Treasury official. He was the first head of the International Monetary Fund, played an important role in formation of the World Bank. He was also a Soviet secret agentâ€”"the most highly-placed asset the Soviets possessed in the American government." Let us honor all those who died that day and those who suffered and died in WW2. On the 70th anniversary of Pearl Harbour, the attack that propelled America into the Second World War, a declassified memo shows that Japanese surprise attack was expected. It was described by President Franklin D.Roosevelt as "a date that will live in infamy", a day on which the slaughter of 2,400 US troops drew America into Second World War and changed the course of history. Now, on the 70th anniversary of Japan's devastating bombardment of the US Pacific Fleet at Pearl Harbour, Hawaii, evidence has emerged showing that President Franklin D.Roosevelt was warned three days before the attack that the Japanese empire was eyeing up Hawaii with a view to "open conflict." The information, contained in a declassified memorandum from the Office of Naval Intelligence, adds to proof that Washington dismissed red flags signalling that mass bloodshed was looming and war was imminent. "In anticipation of possible open conflict with this country, Japan is vigorously utilizing every available agency to secure military, naval and commercial information, paying particular attention to the West Coast, the Panama Canal and the Territory of Hawaii," stated the 26-page memo. Dated December 4, 1941, marked as confidential, and entitled "Japanese intelligence and propaganda in the United States," it flagged up Japan's surveillance of Hawaii under a section headlined "Methods of Operation and Points of Attack." It noted details of possible subversives in Hawaii, where nearly 40 per cent of inhabitants were of Japanese origin, and of how Japanese consulates on America's west coast had been gathering information on American naval and air forces. Japan's Naval Inspector's Office, it stated, was "primarily interested in obtaining detailed technical information which could be used to advantage by the Japanese Navy." "Much information of a military and naval nature has been obtained," it stated, describing it as being "of a general nature" but including records relating to the movement of US warships. The memo, now held at the Franklin D.Roosevelt Presidential Library and Museum in upstate New York, has sat unpublicised since its declassification 26 years ago. Its contents are revealed by historian Craig Shirley in his new book "December 1941: 31 Days that Changed America and Saved the World." Three days after the warning was delivered to the White House, hundreds of Japanese aircraft operating from six aircraft carriers unleashed a surprise strike on the US Navy's base at Pearl Harbour, wiping out American battleships, destroyers and air installations. A total of 2,459 US personnel were killed and 1,282 injured. "This memo is further evidence that they believed the Japanese were contemplating a military action of some sort, but they were kind of in denial because they didn't think anybody would be as audacious to move an army thousands of miles across the Pacific, stop to refuel, then move on to Hawaii to make a strike like this." Japanese emissary's were ignored, though they were presenting a declaration of war. FDR wife, Eleanor diary, she wrote of her husband discusing the Pearl bombing two days before, it's archived. A Hawaiian newspaper front paged, the Japanese attack before the attack, (see archives). Wars are planned, like it or lump it, agree or disagree, it is historical.. American recruits, volunteers were endless led to believe Pear was a sneak attack. I get it, we had to get into it, though I stick with the belief it would have been possable to counter attack at sea rather than the sacrifice Pearl and the recruitment would have been equal. What was it the Japanese Admiral say when he found no Resistance: something like , (we have woken the sleeping giant) Ya know, Oh,Oh, the appearence will be we sneaked up em, the Americans will go nuts. President Franklin D. Roosevelt knew months before the attack on Pearl Harbor of a massive presence by Japan in the Pacific Ocean. 12 days before he knew the exact date of the attack on Pearl Harbor. The Dutch submarine K-XVII allegedly discovered that the Japanese fleet was on its way to Pearl Harbor, this was kept secret. During the war K XVII patrolled in the South China Sea, off Malaya and in the Gulf of Siam. While exiting the Gulf of Siam in December 1941 she hit a Japanese mine and sunk. Here a portion of a telegram from President Roosevelt's Chief of Staff General Marshall to all U.S. Army units in the Pacific dated 27 November 1941. So the day before the K-XVII discovered the Japanese fleet in Hawaii and 10 days before the Japanese attack on Pearl Harbor. A day after the attack on Pearl Harbor even before America and England the Dutch government in exile declare war on Japan. Haven't been able to confirm via other sources that indeed it was the Dutch submarine K XVII who made President Roosevelt aware of the location of the massive presence by Japan in the Pacific Ocean. Harry Dexter White (shown), assistant secretary of the treasury in the administration of Franklin Delano Roosevelt, was a top Soviet spy and agent of influence who not only caused incalculable harm to the United States, but also materially assisted Soviet dictator Joseph Stalinâ€™s spreading of terror and tyranny throughout the entire world. Whiteâ€™s plan was calculated to inflame public opinion in Japan and undermine Emperor Hirohito and Prime Minister Prince Fumimaro Konoye, both of whom favored peace with the U.S. It was also aimed at guaranteeing the rise to power of Japanâ€™s political forces that were beating the drums for war. This is precisely â€” and predictably â€” what happened. However, White did not undertake this move on his own initiative, it is important to note, but as a directive of the NKVD (an earlier name for the Soviet KGB). His Kremlin bosses were most anxious for assurance that Japan would not attack the Soviet Union; they thus expended great efforts through their spy and propaganda networks in Japan, Europe, and the United States to ensure that Japan would strike America, rather than the U.S.S.R. The evidence, FACTS- are undeniable, the problem is many folks simply don't want to know! FF's are the norm for the planners, acceptable losses, colateral damage, sacrificial lambs, the HISTORICAL manipulation of the masses. I have often wondered why FDR didn't attack the the Japanese fleet at sea in national waters, then the reality hit me , recruitment, the long lines of volunteers recruiting would have lessened. The war with Imperial Japan was inevitable, allowing the invasion of the Pearl was a massive intell operation to kick start Americans need for revenge. Fire up the masses syndrome. The other side of the coin is our invasions in the M.E., JUST ONE EX-a few hundred thousand Iraqi's sacrificed in the hunt for non existant WMD's and many folks now beleive our MSM declaring we invaded this nation to take out Sadam. It truly upsets me the younger folks as well as many of our generation will be swallowing this Sh**T.. The U.S. Army will host a remembrance ceremony to honor the fallen and the survivors of the Dec. 7, 1941, attack on Wheeler Army Airfield. Wheeler was one of the first locations struck that fateful day. Enemy aircraft targeted the base at approximately 7:55 a.m. and left more than 30 dead and more than 50 wounded in their wake. USS John C. Stennis (CVN 74) and crew will participate in events planned throughout the week as part of the commemoration of the 75th anniversary of the December 7 attack on Pearl Harbor and Oahu. This opportunity allows fellow Department of Defense members, retired veterans and their families who are not familiar with a U.S. Navy aircraft carrier, the chance to tour the flight deck and learn about what Sailors do aboard ship. I am sure that FDR attack Japan in summer 1941 but he has not excuse and Charles Lindbergh `s anti-war movement was strong. Well I need to correct a minor error. Mao was a "Elis" (after Elihu Yale) this is the more common name for "Yalies" for Yale Students and Grads. I officiated the swimming pools at Yale in the 90's and the skull and bones is a very serious organization of the globalist. Sorry, but this is not civilized. Japanese PM S. Abe will come to Pearl Harbor for "remembrance" but not for apology to USA. Because Us secretary Kerry and Obama also were in Hiroshima for "remembrance" but they refused to apology to Japan for atomic bombardment. Obama even said that bombing Hiroshima is not "war crime". It is interesting that under google it shows up like this: "A Fake Story:" but that is NO WHERE IN THE TEXT OF THE STORY! Seventy-five years after the Japanese attack on Pearl Harbor, some Americans have never stopped believing that President Franklin Roosevelt let it happen in order to draw the U.S. into World War II. "It's ridiculous," says Rob Citino, a senior researcher at the National World War II Museum in New Orleans. "But it's evergreen. It never stops. My students, over 30 years â€” there'd always be someone in class [who'd say], 'Roosevelt knew all about it.'" Conspiracy theories, half-truths and full-on lies are getting new attention as they appear alongside real news and information on social networks â€” but that's nothing new. The official investigations into the Japanese attack started in the 1940s, and even now, each time new documents become declassified, a headline pops up asking whether Roosevelt allowed it. These kinds of bad assumptions and poor intelligence start wars, Citino says â€” an understanding that seems so obvious today even as the conspiracy theories outlive the eyewitnesses to the battle. The US Marine Corps were already developing tactics and equipment for the island hopping campaign, which they later used successfully in the War, as early as the 1920s. President Roosevelt (FDR) provoked the attack, knew about it in advance and covered up his failure to warn the Hawaiian commanders. FDR needed the attack to sucker Hitler to declare war, since the public and Congress were overwhelmingly against entering the war in Europe. It was his backdoor to war. 3.having false information sent to HI about the location of the Japanese carrier fleet. 7 December - 9 hours later, MacArthur's entire air force was caught by surprise and wiped out in the Philippines. His reaction to the news of Pearl Harbor was quite unusual - he locked himself in his room all morning and refused to meet with his air commander General Brereton, and refused to attack Japanese forces on Formosa even under orders from the War Department. MacArthur gave three conflicting orders that ensured the planes were on the ground most of the morning. MacArthur used radar tracking of the Japanese planes at 140, 100, 80, 60, down to 20 miles to time his final order and ensure his planes were on the ground. Strategically, the destruction of half of all US heavy bombers in the world was more important than naval damage in Pearl Harbor. Either MacArthur had committed the greatest blunder in military history or he was under orders to allow his forces to be destroyed. If it were the greatest blunder in history, it is remarkable how he escaped any reprimand, kept his command and got his fourth star and Congressional Medal of Honor shortly later. Prange argued, "How could the President ensure a successful Japanese attack unless he confided in the commanders and persuaded them to allow the enemy to proceed unhindered?" I'll go one step further and say it's inflammatory...just what the fekk is this jerk trying to say? I mean really, what is he remembering? the glorious victory that Japan had on that day? makes me think of when the Japanese student association at U.C.S.C. pulled the stunt of having a heritage appreciation day on 12/7/84 (IIRC)...the bursar of the college (the university is split up into separate colleges and dorms) made a logical reaction to it all, pointed out the blatant insult...and he got fired for it...yeah, U.C.S.C. was way liberal back then. Antony Best, a historian at the London School of Economics and author of book on Pearl Harbor said: "I was very doubtful that the second telegram existed. I think it is just one of those mistakes of history. I have never found any evidence that there was a conspiracy and I have looked high and low." SECRET HISTORY of British intelligence operations in America during World War II reveals that Britain was engaged in a far broader -- and more cynical -- attempt to manipulate the United States in the two years before Pearl Harbor than has previously been revealed. The British planted propaganda in American newspapers, covertly manipulated radio stations and wire services, harassed their political enemies in Congress and the labor movement and plotted against American corporations that were unfriendly to British interests, according to the secret history. They also pushed for creation of an American intelligence agency and helped install William J. Donovan -- whom the British referred to as "our man" -- at its head. Among its many revelations, the history lists the publishers or editors of five of the nation's leading newspapers as friends "who rendered service of particular value" to the anti-Nazi prop-aganda campaign. The study also boasts of British contacts with three leading columnists of the day: Walter Lippmann, Walter Winchell and Drew Pearson. Intelligence experts say it was a masterful covert-action program -- arguably the most effective in history. And by drawing the United States out of isolationism and into the web of British secret operations in a global war, it changed America forever. "BSC ran a vast range of covert operations which, in effect, became the foundation of subsequent OSS and CIA operations," says Thomas F. Troy, a retired CIA officer who is a leading historian of American intelligence activities during the war. Like many intelligence operations, this one involved an exquisite moral ambiguity: The British used ruthless methods to achieve their goals, and by today's peacetime standards, some of their activities may seem outrageous. Yet they were done in the cause of Britain's war against the Nazis -- a cause regarded today almost universally as just -- and by pushing America toward intervention, the British spies helped win the war. Details of the British campaign are contained in a 423-page document that carries the bland title, "British Security Coordination (BSC): An Account of Secret Activities in the Western Hemisphere, 1940-45." This study, marked "top secret," was prepared in 1945 by BSC historians. Ten leather-bound copies were distributed, supposedly to Roosevelt, Churchill and various British intelligence chiefs. None has surfaced publicly, until now. The Washington Post was shown a copy of the BSC history last week and allowed to take extensive notes on it by an individual who asked to remain anonymous. The Post asked Troy, the American intelligence historian, to review the material and verify its authenticity. The BSC history's frank account of British spying makes it "one of the most astounding documents in history," says Rupert Allason, an intelligence historian who writes under the name Nigel West. He says an American publisher, which separately obtained a copy of the BSC study, has asked him to write an introduction. The British Cabinet Office, he adds, is deliberating whether to approve publication of the study in England. (A spokesman for the Cabinet Office had no comment on the matter.) The chief of the British covert campaign was the late Sir William Stephenson, who was celebrated in a 1976 book, "A Man Called Intrepid." The author of "Intrepid," William Stevenson (no relation) said in an interview that he consulted the official BSC history in preparing his book but deliberately omitted details that were "disagreeable" and might hamper future Anglo-American cooperation. Espionage: Past, Present and Future? Just before the "surprise attack," the Father of U.S. cryptography was working for the Canadian government. In 1920, Herbert O. Yardley broke the Japanese code, but in 1929 he was fired by Secretary of State Henry L. Stimson because he broke the Vatican's diplomatic code. In May 1941, the Canadian government hired Yardley to set up their own cryptographic bureau. Yardley's tell all book was published in 1931. [/b] Herbert O. Yardley (1886â€“1958). On Saturday December 6, 1941, Yardley made one final bid to save the job he loved. He sent a lengthy memo to Stone asking that the arrival of his replacement from Britain be delayed thirty days to give him a chance to defend himself. He enclosed a copy of a personal appeal made on his behalf to the President's wife, Eleanor Roosevelt. There was no reprieve. The British had ruled that Yardley had to be out of town before the new man arrived. Yardley's contract had only two more days to run. Though it was a few more weeks before he actually cleared the city, it was effectively his last day on the job. (Bryden, Best-Kept Secret: Canadian Intelligence in the Second World War, p. 89). The firing of Yardley meant that the truth about the "surprise attack" would be covered up, and the Canadians were prevented from developing their own signals intelligence independent of the British. Only hours after the "surprise attack" Canada declared war on Japan. Stephenson had tapes of them discussing the actual date of Pearl Harbor... and he swears that he gave the transcription to FDR. He swears that they knew therefore of the oncoming attack on Pearl Harbor and hadn't done anything about it." "Stephenson had tapes of them discussing the actual date of Pearl Harbor... and he swears that he gave the transcription to FDR. He swears that they knew therefore of the oncoming attack on Pearl Harbor and hadn't done anything about it." "Although they were called British Security Coordination, the Stephenson people were very much a law unto themselves. They made many separate deals with other countries and distributed information amongst the three Western Allies. They controlled many of the secrets of the three countries, including ULTRA and MAGIC, and also had communication influence in the South Pacific and Asia. There were a number of British appointments at BSC, but essentially, Stephenson contacted his friends, put them to work, and had them find staff... The important work these people accomplished during the war has never been fully explored." 219 Pearl Harbor and the Philippines were attacked on December 7, and Guam shortly after Wake Island. In an AFTERWORD to Prange's At Dawn We Slept co-authors Donald Goldstein and Katherine Dillon suggest that Haan's warnings went ignored because it was believed that he had earlier been a double agent for Tokyo in 1936. Goldstein and Dillon therefore argue that "one can readily understand why the U.S. government would hesitate to act upon his unsupported word in such an important matter." Goldstein and Dillon fail, however, to mention Haan's accuracy -- and that Prange overlooked Haan altogether. (Prange, At Dawn We Slept, p.741). Japanese Army and Naval Operations Orders concerning an attack on (to be carried out December 8th in Japan/December 7th in Pearl Harbor) are circulated to important government and military officials. Important Japanese Embassies across the globe are sent copies of the plan, thereby increasing "the number of personnel who knew all or part of Japan's great secret... several thousandfold." 700 copies of the plan were circulated. It is possible that early drafts of the plan circulated much earlier 221 (See January 21 and 27, 1941) The plan details an attack "in the east [against] the American Fleet." It also discusses an attack against British Malaya, the Philippines, the Netherlands East Indies and Burma, and the American outposts on Guam and Wake. Specific references to the impending attack on Pearl Harbor are minimal: "Will observe and attack American Fleet in Hawaii area. Will make a surprise attack on the channel leading into Pearl Harbor..."
As Sorge confirmed the Japanese move South to the Soviets back in October, it is possible that Sorge had advanced intelligence of the details of the plan. (Costello, The Pacific War, pp.635-636). Nov 7, 1944, Richard Sorge, a half-Russian, half-German Soviet spy, who had used the cover of a German journalist to report on Germany and Japan for the Soviet Union, is hanged by his Japanese captors. Sorge fought in World War I in the German army, and then earned his doctorate in political science at the University of Hamburg. He joined Germanyâ€™s Communist Party in 1919, traveling to the USSR in 1924. His first major assignment for Soviet intelligence was in the late 1920s, when he was sent to China to organize a spy ring. Returning to Germany, he joined the Nazi Party in 1933 to perfect his cover as a loyal German. He proceeded to develop a reputation as a respected journalist working for the Frankfurter Zeitung, finally convincing his editors to send him to Tokyo as a foreign correspondent in the mid-1930s. Once in Japan, Sorge proceeded once again to create a spy ring, which included an adviser to the Japanese cabinet and an American communist, who was also working for Soviet intelligence as Sorgeâ€™s interpreter. Sorge had so successfully ingratiated himself with the German diplomatic community in Japan that he was allowed to work out of the German embassy, giving him access to confidential files. At the same time, he also befriended Japanese government officials, attempting to convince them not to go to war with the Soviet Union. But Sorgeâ€™s brilliant spy career came to an end on October 18, 1941, when Japanese counterintelligence exposed his operation and he was arrested, along with 34 members of his ring. He was finally hanged in 1944. Twenty years later, he was officially declared a Hero of the Soviet Union. This article is a description of the disaster in the Philippines and the parts played by some individuals in it. In its last sections, I discuss possible reasons for the disparity in punishment meted out to the officers surprised at Pearl Harbor and officers who, knowing that war had started, failed to prevent or blunt the disaster that hit their commands. Convinced that the Japanese would be unable to attack before April 1942, MacArthur was confident that the Philippines defenses would be proof against the assault. On December 5, 1941, in a meeting with British Admiral Tom Phillips, the commander of the Royal Navy detachment at Singapore, MacArthur spoke confidently, "The inability of an enemy to launch his air attack on these islands is our greatest security.... [N]othing would please me better than if they would give me three months and then attack here ... that would deliver the enemy into our hands." As it turned out, the Japanese didn't please MacArthur. They attacked three days later. According to Richard L. Watson, author of the chapter about Pearl Harbor and Clark Field in the Army Air Force History, Army Air Forces in World War II: Vol. 1: Plans and Early Operations, January 1939 to August 1942, "about 90 pursuits" were in the islands. Bartsch (2003) presents a more detailed inventory (see table 3). The USAAF had 71 P-40Bs and Es, the only "modern" pursuits, in the islands. The other pursuits, the P-35As, lacked adequate armament, armor, and self-sealing gas tanks. The B-18s that appear as equipment of the bomb groups were inadequate bombers and were used as transports. Army and Navy officers in the Philippine Islands learned about Pearl Harbor within minutes of the attack. William Manchester, in his generally positive recounting of General Douglas MacArthur's life, American Caesar,  and Stanley Wientraub, more critical of the general, agree that the first official news of the attack was a phone call to Admiral Thomas Hart, the commander of the U.S. Navy's Asiatic Fleet. "At 0230 of the 8th (0800, 7 December, Pearl Harbor time)," about five minutes after the Pearl Harbor attack began, a Navy radioman in Manila heard the famous "This is no drill" message. He passed it to the officer of the day who telephoned Admiral Hart in his room at the Manila Hotel. The ringing telephone woke Hart at "just a few minutes before" or "a few minutes after" 3:00 AM . Commercial radio broadcasts were the army's first source of information about Pearl Harbor. Bartsch credits Pvt. Harry Seiff, the 20th Pursuit Squadron's (PS's) cook, as being the first soldier at Clark to hear about Pearl Harbor. News spread rapidly, and Brigadier General Richard Sutherland, General MacArthur's chief of staff, telephoned MacArthur in his penthouse of the Manila Hotel at about 3:30 AM. Less than an hour and a half after Pearl Harbor, General George C. Marshall, USA Chief of Staff, sent a radiogram to MacArthur. Handed to MacArthur at 5:30 A.M., Manila time, the message stated, "hostilities between Japan and the United States ... have commenced.... Carry out tasks assigned in Rainbow Five... ."
Characteristic of the reporting of that confused morning, the extent of Army-Navy interactions is unclear. Manchester states, "Hart neglected to share this vital information [Pearl Harbor] with MacArthur or any other Army officer." Weintraub writes that Hart's chief of staff, Admiral William R. Purnell, "rushed the news to General Sutherland...." Bartsch (2003) agrees with Weintraub's account. "Twenty-five minutes later (at 3:55 AM), he (MacArthur) received confirmation of the attack through Admiral Hart." Given Manchester's bias toward MacArthur, he might be expected to favor interpretations that suggest the people around him failed the general; in this case, the Navy failed to inform him. Weintraub and Bartsch, more critical of the general, go in the other direction, citing evidence that MacArthur had been well informed. I was on the way to breakfast at the mess hall [at Clark Field] a block away. It seemed that it would be just another day of preparing to go to war until somebody said, "There is a rumor that the Japanese attacked Pearl Harbor." When informed about Pearl Harbor, General Brereton drove to see General MacArthur to request permission to carry out the planned-for bombing of Japanese bases on Formosa. Arriving at USAFFE Headquarters at 5:00, Brereton did not see MacArthur. Manchester says that Sutherland told Brereton that MacArthur was in conference with Admiral Hart and could not be disturbed; Bartsch states that Sutherland told Brereton that MacArthur was in conference; Weintraub writes that Sutherland had Brereton "cool his heels" before telling him that MacArthur was unavailable. As Brereton left USAFFE Headquarters, Sutherland told him to go ahead with his plans and that he would secure MacArthur's permission for the attack. Time was critical. Clearly, an attack should be launched before the Japanese struck. Neither that attack nor any other was forthcoming. Brereton returned to USAFFE headquarters at about 7:15. Again, Sutherland prevented his seeing MacArthur and told Brereton that MacArthur had not responded to his request for permission to attack Formosa. When Brereton pressed Sutherland, Sutherland went into MacArthur's office, quickly returned, and said MacArthur had denied the request. "The General says no. Don't make the first overt act." The words "first overt act" play a major role in understanding, interpreting, or explaining away the events of December 8, 1941. For this discussion, the words originate in a "war warning" that General Marshall sent to Army commanders on November 27, 1941: "... hostile actions possible at any moment.... If hostilities cannot, repeat, cannot be avoided the United States desires that Japan commit the first overt act...."
Sutherland and MacArthur cite compliance with that message as a reason for denying Brereton permission to launch the bombing attacks. Certainly bombing Formosa would have been an overt act. Brereton's argument that Pearl Harbor had been an overt act did not persuade Sutherland. Neither did Sutherland's knowledge, not shared with Brereton, that Japan had already bombed Davao, a port on the Philippine island of Mindanao. After the bombings of Pearl Harbor and Davao, hardly anyone â€“ except Sutherland and MacArthur â€“ would characterize a subsequent American strike as the "first overt act." MacArthur had been a serving officer in the U.S. Army since July 1941, when he resigned his reign as Field Marshal of the Philippine Army. As a U.S. Army officer, he was subject to Marshall's command to initiate RAINBOW 5, which included air attacks on Japanese targets. His cavalier disregard of that order hardly squares with his self-portrayal as the embodiment of West Point's credo "Duty, honor, country." At about 8:00, Brigadier General Gerow in Marshall's office telephoned MacArthur to ask if he had received the cables that Marshall had sent earlier in the morning. MacArthur said yes and offered no explanation for his having not responded sooner. Gerow said, "I wouldn't be surprised if you got an attack there in the near future." To which MacArthur responded, "tell General Marshall that 'our tails are up in the air.'" Tails had been "up in the air. On the night of December 7-8, as on several nights during the preceding week, the Iba radar (the only operational radar in the Philippines) had detected airplanes flying from the north. At a little after midnight, 1st Lt Hank Thorne, commanding officer of the 3rd PS , led a flight of six P-40Es into the air, and, guided by radar, attempted an interception. Iba radar lost radio contact with Thorne's flight and the radar operators watched as path of the American pursuits intersected that of the Japanese. The P-40 pilots saw no airplanes and returned to Iba to make the first night landing at that field in the lights of cars and trucks shown on the runway. A few hours later, at 4:00 A.M. or so, and after news of Pearl Harbor had arrived, the pilots of the 17th and 21st PSs at Nichols Field on the outskirts of Manila, were sitting in the cockpits or beneath the wings of their P-40Es. At Iba, the pilots of the 3rd PS in their P-40Es, and the pilots of the 20th PS in their P-40Bs were in a similar state of readiness at Clark. The 34th PS at San Carlos Field, equipped with woeful P-35As, had not been alerted in the pre-dawn darkness. Sleepy and on-edge, pilots wondered about the war. When would it reach them? Would their machine guns fire? (many had never been fired in flight). How would their heavy, slow-climbing pursuits perform? (on interception training flights, U.S. bombers had simply flown away from them at altitudes over 20,000 feet). A little before 8:00 A.M., Iba radar informed the Air Warning Service (AWS) at Nielson Field that at least 30 Japanese aircraft were flying south over Luzon apparently headed for Clark Field. The warning service teletyped that information to 24th PG headquarters at Clark. Major Orrin Grover, commanding officer of the 24th PG, scrambled two squadrons â€“ the 17th at Nichols Field and the 20th at Clark â€“ and sent them to patrol at 15,000 feet over Tarlac, 21 miles north of Clark. In his after-action report, Grover wrote that he ordered the 34th to patrol over Clark in its P-35As in case any Japanese planes broke through the 17th and 20th. There is no other indication that the order was given to the 34th. In any case, no such order reached the 34th, which was on the ground at San Carlos when the Japanese attacked four hours later. The takeoffs of the 20th PS and the 19th BG from Clark were something of a miracle. Downwind, crosswind, and into the wind, accelerating P-40Bs dashed around and between lumbering B-17Cs and Ds in hair-raising near-collisions. All the pursuits and bombers got safely into the air. Orders for the 19th BG were as much up in the air as were the bombers. Brereton returned to his office from his 7:00 rebuff by Sutherland to tell his staff that they could send three B-17s on a photoreconnaissance mission over Formosa. Brereton's staff questioned the need for the reconnaissance flights. According to Captain Allison Ing, on the FEAF staff, target folders were complete enough to plan bombing attacks. At 8:00, Brereton called Sutherland. Fifty minutes later, Sutherland returned the call to say, "Hold off bombing Formosa for the present." Sutherland also told Brereton not to call again. Maybe an hour later, after receiving reports of Japanese bombing of cities north of Clark, Brereton ignored Sutherland's instruction, and called again. At 10:00, Sutherland reiterated that no offensive mission was authorized. All that changed, 15 minutes later. MacArthur, himself, called Brereton and authorized strikes on Formosa. Two and a half hours after the frenzied 8:30 takeoff from Clark, essentially every aircraft in the islands was on the ground, being serviced or ready for takeoff. The pilots of the 17th and 20th PSs had flown back to Clark, along with the B-17s of the 19th BG. The 3rd at Iba, the 21st at Nichols, and the 34th PS at San Carlos, had remained on the ground. The outward appearance of a normal peacetime day in the FEAF disappeared at 11:27 A.M. Iba radar picked up a flight of aircraft over the Gulf of Lingayen on the west coast of Luzon, north of Iba Point and reported the sighting to the AWS at Nichols. By 11:37, AWS teletyped the radar report to 24th PG Headquarters at Clark Field. And from here, the course of warnings and messages and orders grows blurry. Records of teletyped and radioed messages and orders are obscured in or have been lost from, understandably, poor records and what are surely self-serving after-action reports. What is certain is that no American pursuit intercepted a single Japanese bomber. It's also certain the 19th BG 's B-17s and the 20th PS's P-40Bs were on the ground, when Japanese bombs began to fall at 12:35. As Whitcomb, then a B-17 navigator, writes, "The first notice we had at the 19th Bombardment Group Headquarters was when someone screamed, 'Here they come!'" Fifty minutes after the first bombs fell on Clark, the Japanese flew back to Formosa, leaving Americans confronting death and wounds, destruction and damage, fire and smoke, and demoralization. When the Japanese flew away, half the B-17s and one-third of the P-40s were destroyed, and two of the four P-40-equipped pursuit squadrons were eliminated as combat units. As surely as if all its planes had been destroyed, the fifth pursuit squadron, the 34th, equipped with P-35As, had also been eliminated from the war. Its pilots knew their planes were deathtraps in aerial combat with Japanese fighters. Two days later, on December 10, the Japanese bombed and strafed Nichols and Del Carmen Fields, leaving those bases in shambles and destroying about half the remaining P-40s and all but five P-35As. Three days after war's start, the Japanese had eliminated U.S. airpower from the Philippines at the trifling cost of a few aircraft and their crews. On the afternoon of December 8, MacArthur had announced that B-17s would strike Formosa the next day. That attack was not launched. Indeed, the B-17s, intended to play the major role in defending the Philippines by striking and eliminating Japanese bases, never played that role. The destruction of American aircraft on the ground inflicted a "fatal blow" on the FEAF and American prospects in the Philippines. At Pearl Harbor, the carnage had ended as the last Japanese attacker flew away. Rescue and repair began, the wounded were aided, and except for those who died from their wounds, there were no more casualties. Certainly, the loss of several battleships dealt a blow to U.S. prestige and morale, but the absence of those ships was to make little difference in the war. The consequences of the Japanese attacks in the Philippines were more far reaching. Without air support, U.S. and Philippine troops mounted a resolute defense against the Japanese. Only on April 9, 1942, more than a month after the Japanese had expected to complete their conquest, did the combined U.S. and Philippine forces, having suffered 20,000 deaths, surrender on Luzon. More deaths and suffering awaited them. Only half the 20,000 Americans that went into Japanese captivity survived the war; some were murdered outright, some were tortured, many died of overwork, maltreatment, and absence of medical care. , A larger proportion of captured Filipinos died. The surrender of the Philippine Islands marked the largest surrender of U.S. troops and the largest loss of U.S. territory in history. It extended the reach of the Japanese Empire 1,000 miles into the Pacific, and the Naval Base at Cavite, near Manila, the excellent harbors on Manila Bay, and the American airfields were valuable additions to Japanese naval and military strength. Neither the successful launch of the planned bombing attacks against Japanese bases on the first day of war or the loss of fewer U.S. airplanes in the initial Japanese attacks would have saved the Philippines from conquest. U.S. forces in the Philippines were simply inadequate to block the Japanese. Nevertheless, a successful U.S. attack might have caught some Japanese planes on the ground and might have disrupted or reduced the ferocity of Japanese attacks. Preserving more U.S. aircraft would have left the U.S. with a striking force â€“ the B-17s â€“ and some aerial defense â€“ P-40s. Instead, U.S. air power in the Philippines was rendered toothless before it could strike a blow. Ben was at Clark Field as an Operations Specialist and was there on December 8, 1941 when the field was attacked. Ben began drawing in the Bilibid Prison Hospital while recovering from the brutal Tayabas Road Detail. Throughout the program I use his drawings depicting the Bataan Death March. Ben was born in Roundup, Montana in 1917. His parents were ranchers and Ben worked on the family ranch. After the Depression claimed his family's ranch Ben continued to worked on nearby ranches. In 1940 Ben joined the Army Air Corps and was sent to the Philippines. Ben was surrendered on Bataan and participated in the Death March in April of 1942. 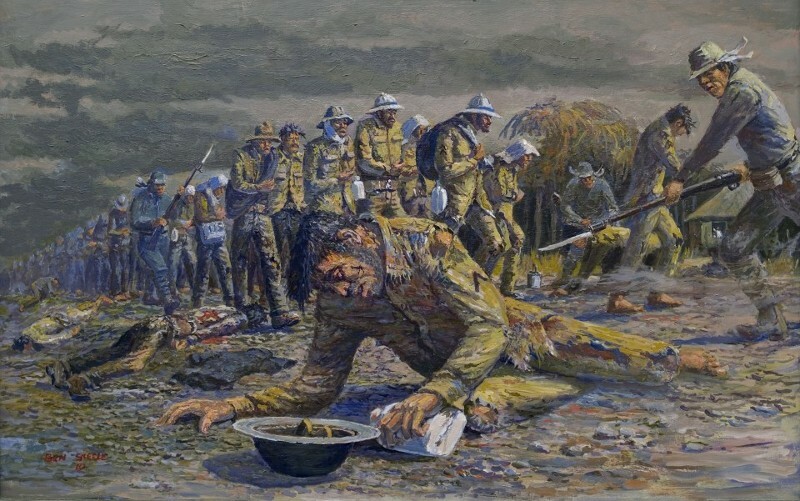 The Death March is seared in the memories of all who survived and many of Ben's drawings depict the Bataan Death March. Ben, as a POW, began drawing while in the Bilibid Hospital in Manila. Ben had been on the infamous Tayabas Road Detail where nearly one third of the POW's died. Ben was brought to the hospital in terrible condition suffering from dysentery, beri beri, pneumonia and malaria and he was given Last Rites. But he survived and while recovering he began to sketch on the cement floors of the hospital with charcoal. First were cowboy scenes and later he began to draw life as a POW. Drawing would be one of his survival mechanisms. 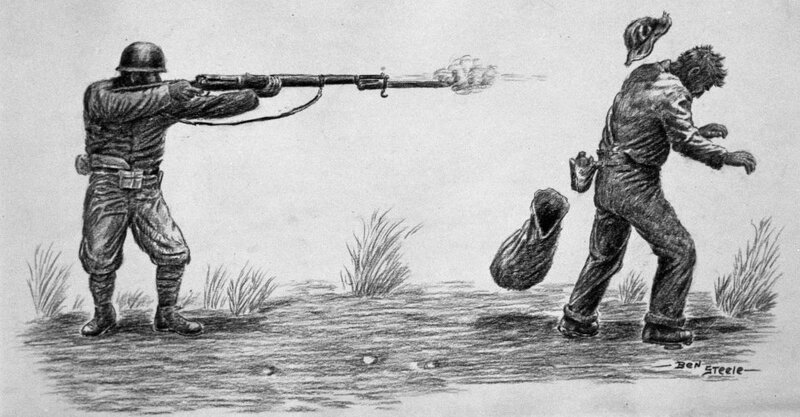 He had to be very careful not to be caught by the Japanese since many of his drawings documented the brutal treatment by them. Ben, like many of his buddies, was destined to be shipped to Japan as a slave laborer. Ben left his drawings with Father Duffy a Catholic Priest for safe keeping. Unfortunately, Father Duffy was later shipped out on the Oryoku Maru for the same purpose. But the ship was bombed and sunk by American Bombers and the drawings were lost, although Father Duffy survived. After the war Ben was encouraged to continue to pursue art by his psychiatrists and enrolled at the Cleveland Institute of Art. He continued his studies and graduated from Kent State with a BSE and a MA degree from the University of Denver. He became a professor of art at East Montana College and taught there 22 years. Ben recreated the drawings that had been lost and are now known as The Ben Steele Prisoner of War Collection. On Wednesday, August 29, 1945, President Truman gave out the reports of the Army and Navy Boards directed by Congress to investigate the responsibility for the great disaster of December 7, 1941, at Pearl Harbor. Now the two Army and Navy reports expand the guilt to cover General Marshall, Admiral Stark and former Secretary of State Hull. Marshall and Stark were the Army and Navy chiefs in December. 1941. All the top commanders have now been blamed, plus various lesser commanders. But the greatest commander of all is left out â€“ the Commander-in-Chief. In the 150,000 words of these findings and comments the name of Franklin D. Roosevelt stands out in almost monumental conspicuousness by its absence. The Army and Navy chiefs, the former Secretary of State and Congress have been blamed and the President of the United States has added to the culprits the 130,000,000 people of the United States. The only person not blamed is Franklin D. Roosevelt, who was running the whole show. It was Roosevelt who personally managed the whole crisis. It was Roosevelt who bottled the fleet in Pearl Harbor. It was Roosevelt who stripped the base of its defenses. First then, let us look at the crisis as it developed in Washington. Let us see it now in the light of the facts which this government has hidden and which I will now reveal publicly for the first time. However, in spite of all the suppressions, the story of Pearl Harbor is known. And here I propose to tell it. Put in plain terms the tragedy of Pearl Harbor was the dark fruit of three incredible blunders. First in importance was the manner in which the crisis was managed. The second blunder was the bottling of the fleet in Pearl Harbor. The third was the stripping of the defenses of Pearl Harbor. It was Roosevelt who personally managed the whole crisis. It was Roosevelt who bottled the fleet in Pearl Harbor. It was Roosevelt who stripped the base of its defenses. First then, let us look at the crisis as it developed in Washington. Let us see it now in the light of the facts which this government has hidden and which I will now reveal publicly for the first time. Why Was the Fleet in Pearl Harbor? Here we must note a fact of great importance. The Pacific Fleet had always been based on our West Coast. Pearl Harbor was a supply and repair base of operations in the mid-Pacific. It was Roosevelt who forced the change of bringing the Fleet into Pearl Harbor. In 1940, Admiral Richardson was made Commander-in-Chief of the Pacific Fleet. He was one of the Navy's foremost figures. Since his earliest days, after leaving Annapolis, he had made the study of Japanese warfare his life work. He was beyond question the Navy's outstanding authority upon Pacific naval warfare and Japanese strategy. He was the logical man for the post. As the war clouds darkened over the Pacific he was in the spot for which his whole professional life had been a training. Richardson was ordered to berth the Pacific Fleet in Pearl Harbor. This he refused to do â€“ an act no one but a very distinguished officer could risk. He was ordered a second time and again refused. It was Richardson's belief â€“ and indeed generally supported by the Navy â€“ that the Fleet should never be berthed inside Pearl Harbor where it would be a mark for attack. This was particularly true in such troubled times when the airways of the East were hot with rumors of approaching conflict. What is more, Richardson held the belief that Pearl Harbor was the logical first point of attack for the Japanese High Command, wedded as it was to the theory of undeclared and surprise warfare. But Richardson was overruled by Roosevelt, the amateur admiral. Whether Richardson was relieved of his command or resigned in protest I do not know. Certainly he departed from it. At this point, Admiral Husband E. Kimmel was placed in command.